I will never forget the first time I went running. It was on a rubberized running track, early in the morning and I really thought I could easily do a couple of rounds. Disappointingly, I barely finished a single round! As I was sitting on the grass, wondering how I could be so ‘unfit’, I noticed a lady far chunkier than me, running laps around the track like it was nothing. I tried counting how many she could do but she just kept going and going. All I could think about was “I want to be like her”! I learned many things through my journey from being a newbie runner to an experienced one. I would like to share them with you. Looking back at my first running day, I strongly believe that watching that lady run laps gave me a huge boost of motivation. I kept saying to myself “if she can do it, I can do it”. Thinking of the day when I too could run that long kept me going when I thought of giving up. That stranger became my motivation. If you are new to running, sign up for a fun run or marathon and train with that in mind. When I was new, I signed up for a 5k Fun Run and completing that run became my goal. The secret when setting goals is to make sure that your goal is measurable. It is very difficult to get out of bed to run some days but having an appointment with someone gives you an extra reason to roll out of bed. When I started running, I kept recruiting friends to run with me and we always were there to motivate each other to keep going. After a few weeks, the running track became too boring for me so I decided to mix my running with some Zumba to spice things up. It worked wonders! Try to find different routes to run each time or try mixing up your running with some other activity you like. This way, you will never feel that running is a chore. One of the things beginners lack is endurance. Since your body is not accustomed to running, you will not be able to run for extended periods of time. Pushing yourself is not a good idea so how do you build endurance without tiring yourself out? The Run-Walk method is the answer. Initially, I looked down on those who kept alternating walking with running because I thought of them as ‘losers’ but I was very wrong! You can alter the amount of time you spend walking and running as you become more seasoned. Trust me- there is no better way to get into the ‘expert runner’ mood than to look like one. Wearing whatever sporty clothes you have in your closet is not enough. There is a huge physiological effect when you actually look like the runners you see in marathons. I remember how I felt so much different when I had my complete attire with headphones, a timer, great trainers and compression leggings. Invest in the right clothes and footwear and you will not only look but feel like a real runner. 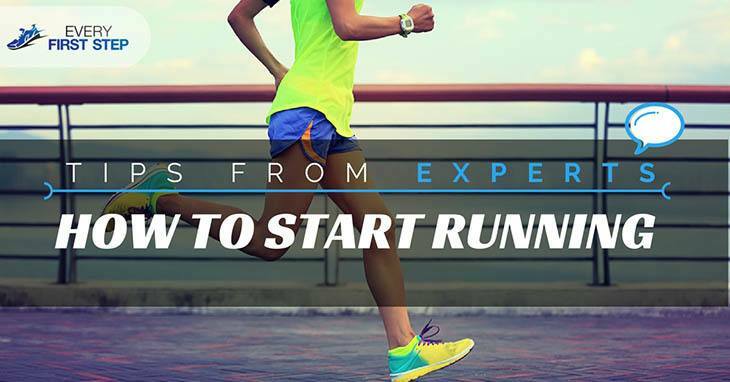 Those are three tips I personally believe will help new runners but let’s hear what other experts in the field have to say. "One of the biggest things I find new runners struggle with is getting burnt out in the first few weeks.Most of the time it is because they are doing too much too soon and experience pain + exhaustion, making it difficult for them to want to continue. If you are just starting out running, it's OK to start slow. Start by running a half mile every other day. Then, each week, add another quarter or half a mile to your runs until you are running 2 miles 3-4 days per week. From there, you can start adding more distance or running more frequently!" "My name is Agness, a travel and fitness blogger of Run Agness Run, Fit Travelling and Etramping.com. I was born and raised in Poland in a non-active family so when I discovered sport at the age of 20, it quickly became one of my biggest fascinations." "I started from short jogging sessions in the morning here and there to wake me up and release these endorphins, and when it wasn't enough for me anymore, I started lifting weights and experimenting with different forms of exercises to challenge myself, get stronger and more tone up. From HIITs to calisthenics - I've done it all. I'm 29 now and although I always change my workouts due to travels, running is still on my schedule. It helps me release the stress, cope with a bad day and discover beautiful places when I visit a new place. I’ve always been attracted to the freedom that running offers, not to mention that it’s a great way to keep fit, stay in shape and live an awesome healthy lifestyle." "This year I'm mostly focusing on being more flexible and functional with my body. As opposed to the last year where I was mainly building muscles through heavy weight lifting at the gym, 2018 is dedicated to full body workouts outdoor using only my body weight and some resistance bands. Although my current workouts are mostly HIITs and cardio based, I also do calisthenics and plyometrics exercises. On top of that, I've recently started taking Muay Thai classes that help me a lot achieve my goals of being functional, agile and fast. I train mostly 4 times per week and my workouts are between 30 and 60 minutes long." "My name is Lea Genders and I am a running coach and personal trainer that specializes in strength training for runners. You can get all the free running, nutrition and strength training advice over on my blog or visit me and my favorite four-legged running partner over on Instagram"
"When you are new to running, the key to success is to start slow. Go even slower than you think you need to. I like to channel the Beastie Boys in my head and repeat "slow and low, that is the tempo" to remind myself to slow the pace down. At first it is all about building endurance, and in order to run farther you have to run slower. You will have plenty of time later to work on improving speed. One thing at a time. Runners often start out too fast and burn out before they get to the end of the block, they never give themselves a chance. Slow down." "Running is a great sport that doesn't require a lot of equipment but a proper pair of running-specific shoes are essential. You can't dig out your old gym shoes from the back of the closet or wear those same shoes you've been wearing to your cardio dance class for the last year. Running shoes are specifically made to give you the proper support for running. If you're not sure what shoes to buy, go to a speciality running store and ask fan expert for help. It is an investment into your sport and will help you run more efficiently with reduced chance of injury." "Running is an individual sport that is part of a large running community. The more support you have, the more successful you will be. You could hire a running coach, but if that is not in your budget, join a local run club, find running social events in your community or connect with like-minded runners on social media. Runners are generally a supportive and inclusive group willing to help and encourage as needed. Find your running tribe." There you have it: listen to the experts, put on your running shoes and in no time, you will have your own tips to add to this list.